These shirts are constructed using a combination of flat rings with wedge rivets and solid punched flat rings, European 4-1 weave and with an internal diameter of 9mm. Compared to the same style in round riveted, there is a weight saving of up to a kilo, so for those where every ounce counts, such as on horseback, the wedge riveted is well worth a look. The wedge rivetes are generally thought to be a later development in the transiition of maille and seem to appear from the C11th. 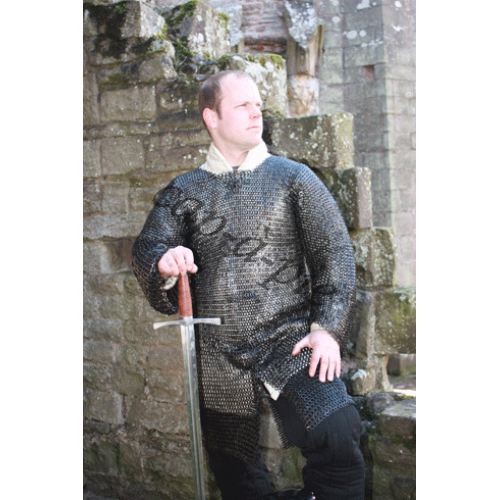 Although much slower to construct than the round rivet, the wedge maille does have the advantage of a smooth finish on the inside with only a very small raised section where the rivet is. 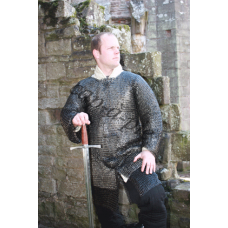 Do you have any questions about Wedge Riveted Hauberk 48"? The shirts are constructed using a combination of flat rings with round rivets and solid punched fl..